So how colourful is your house? | Where to next? So how colourful is your house? Paint is one of the cheapest and quickest ways to transform your home—inside and out. Some people love big bold colours in their rooms, while others (Poor John is an example) prefer muted colours. Off-white is his favourite, but I don’t let him choose all the colours in our house. 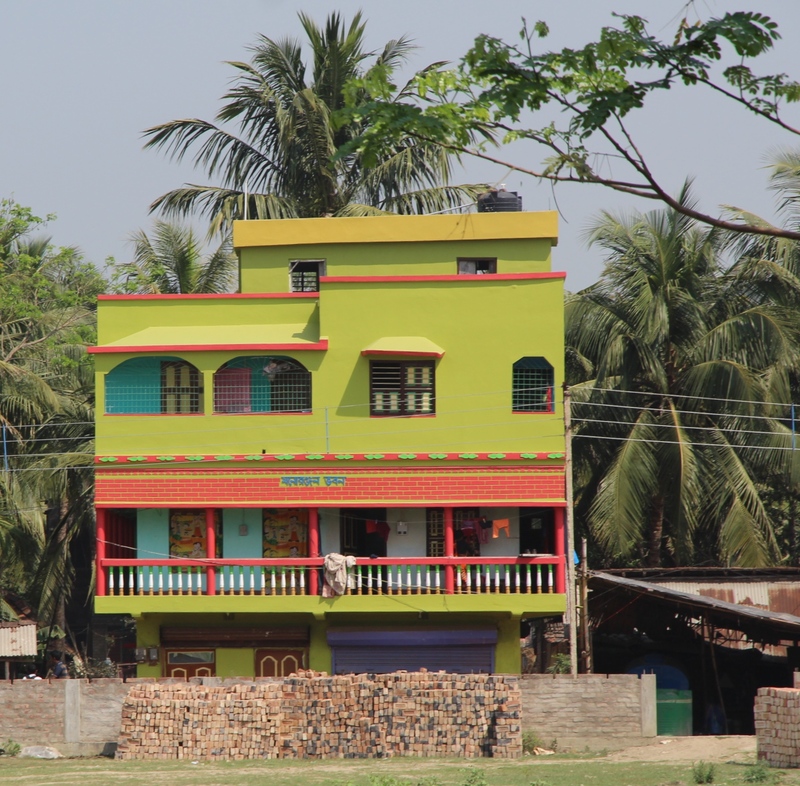 Exterior paint jobs run the gamut too, but nothing quite prepared me for the use of colour in and on Indian homes. Because we’re travelling around India by road—we’ve already covered 10,000 kilometres on this trip—I’ve had plenty of opportunity to whizz by houses of every colour imaginable. Once I got over the shock of seeing so many eye-smiting electric green houses with orange and brown verandahs and trim, I started photographing some of the most startling combinations, as well as the most, in my opinion, subdued, which you see just below. Sometimes a homeowner builds a small shop as part of the house, so you may notice counters and goods. These are still predominantly houses and not businesses. Virtually all of these photographs have been taken from a moving vehicle, so the angle, focus and amount of house shown vary, but they’re enough to show you just how the imagination takes flight. There are some fabulous ones that aren’t included here simply because I wasn’t quick enough with the camera. Such a pity. At least interiors stand still and they can be equally creative. Just above are pictures of Deepti and Anand dining in front of electric blue, and Gary trying to relax in an electric pink hotel room in Jaisalmer in Rajasthan. 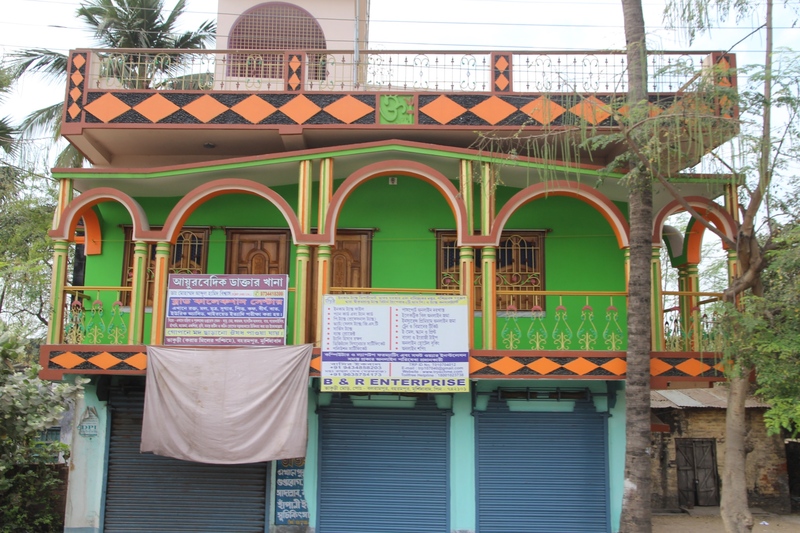 Gary just happens to be a house painter and while he gets a kick out of the array of colours in use in India, he is appalled by the way paint is slopped around. Haven’t these people heard of drop cloths? Doesn’t anyone know how to tape trim? But Gary’s pink room is no exception. 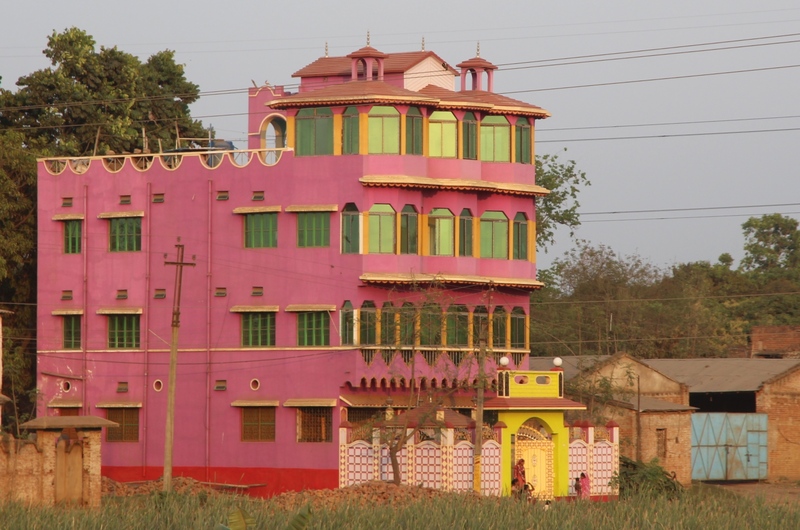 Pink and mauve seem to rule as house colours in India, along with shades of green (and almost never grey). 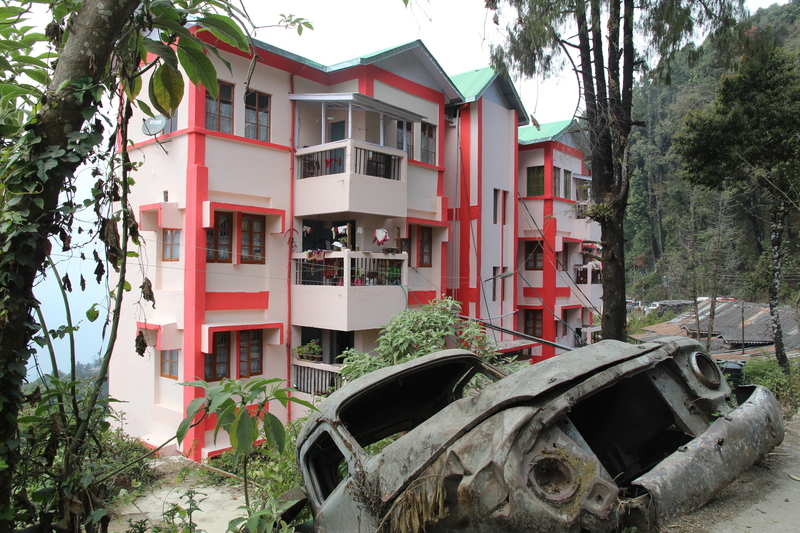 The exterior of our small hotel in Kalimpong in West Bengal is pink (no photo because the street is too narrow). Inside and out, the quality of work is fairly good; however, colour choice on the inside is another matter. In just our room, the walls are chartreuse, the carpet is red (and has been pieced together so there isn’t any carpet under the bed), the trim is brown, the doors are white, the curtains are blue and white floral, the bedding has brown and amber circles, the bathroom has five kinds of tiles with five different colours and patterns, and the ceiling is timber. I’d take a picture but I can’t step back far enough to capture the full impact. So I’m wondering. Do any of you out there have anything that can compete with these gems. I’d love to see them. P.S. Interested in more colourful house photos? Let me know and I’ll keep taking and posting them. P.S.S. If you saw the last post about our daughter getting married, I thought you’d like to know they have arrived in Paris. They’ve shared a sunrise picture from their temporary apartment. Needs a bit of colour! ← Our daughter got hitched—and we missed it! The paint jobs always give me something interesting to look at while we’re riding along. Inside, my house is “safe”. Outside, I’ve got lots of colour, including the back wall which I’ve done as a Mondrian painting. I love it. I’m overseas right now, and don’t have access to those photos, leggy one. Enjoy your trip! I’m patient. I love love love colorful homes (inside and out), always had this disagreement with my sweet mom who prefers a more classic/simple look…she would say “when you have your own home paint it whatever color you like!” Which is why now I am sitting in a fuschia living room!!! Thanks for sharing these pictures, I of course, am loving the pink house! I wanted to do my teenage bedroom in pink and orange, but my mother objected. I love colour too, but am perhaps beyond that exact combination. So any pictures of your living room? I love the colour fuschia! 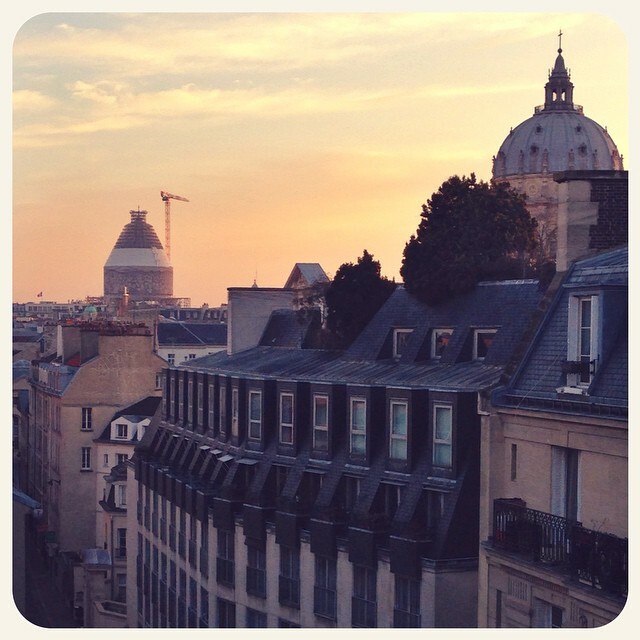 Oh Paris in the Spring. They should love it!!!!! What a great color tour. When we finished the reno job on the bungalow, I picked ‘Smurf Blue’ for the outside. It has settled down a bit, but in a strong sunlight, you can still see Smurfette. Smurfette is a great shade of blue. Our house is brick so only the trim is painted and it’s blue and charcoal. Love the colour of these houses. Mine is very dull but I liked the green, blue and yellow fronts to the wooden houses in Eastern Russia, seen from the Trans Siberian Railway. Russia, as well as parts of Central Asia, have colourful houses I’ll try to post some pictures in future. I don’t think I could look at that every day Peggy. They’re all so very, very bright! But long live diversity. My natural tendencies are more in line with Poor John’s. It’s much easier to coordinate and change the things around. We have so much colour in our furnishings that most of the walls in our house are subdued. I’d have to have colour one way or the other. I was fascinated by the amazing colours of homes throughout Indonesia as well! I’ll have to go back to Indonesia and have another look. You could pick the houses owned by Indians when we lived in Nigeria. They stood out like a block of neapolitan ice cream. I prefer neutral interior decor so that my pistachio coloured leather lounge sute looks good with its chocolate and pistachio cushions. Neapolitan ice cream! What a perfect description. Green, in general, is my favourite colour, so I’d feel right at home on your pistachio lounge suite. Mine is forest green. What vibrant homes! Near to me is a new building estate where many of the homes are a dull grey concrete with black roofs (terrible for our Australian sun). They look so depressing. I remember wooden homes of my early childhood often being painted shades of green, pink, yellow and blue. In fact, I often talk about “when we lived in the pink house” or when “we lived next door to that blue house” to my relatives. My current home is a gentle, conservative cream with small heritage green features. Inside though there is a burst of colour in a hallway and bedrooms with pinks, purples and yellows. The work of the previous owner. Fascinating to see how colour can change the character of a home. Colour brings a place to life. One of our bedrooms is ‘bluple’—a sort of blue–purple—with sunflower yellow curtains. Looks amazing. I could never live in a house let alone an entire estate of grey and black exteriors. How depressing, how unimaginative, how impractical. Blech. I love the colors!! Do you know if this has a deeper meaning or if they’re just into flashy houses? I don’t think the colours have any special meaning. Today we met a man who was watching his new house being built. We asked what colour he was going to paint it and he said he hadn’t decided yet. He even asked us for suggestions. Very cool! I would never ask a stranger for suggestions on that topic haha! Great question! I was also going to ask the same thing (RE: significance of colours). I think it’s just a colour a person likes. I would love to paint my house to make it stand out like those houses. Keep posting the pictures, they are interesting! I will post more. Yesterday I photographed a house with orange stripes. Gary may have had the most rested night of everyone – There was research done long ago (don’t know if it’s been replicated) – put prisoners in bubble gum pink cells and they became subdued. Put prisoners in blue cells and they became agitated. (Makes one stop and think about the colors we pick for babies). Oh Curious, thanks so much for reminding me about the pink. There’s a great book out called ‘Drunk Tank Pink’ that explains the research and findings. Read it if you can. Excellent work! Like you, I’m not keen on glow-in-the-dark colours, but almost anything goes. Love your brother’s description of the new taxi colour. Too funny! Wow! that’s very colorful houses indeed. I am not fond of pink but it doesn’t look too bad depends on where you are and I guess that part of India it might be a lucky color or something? I know what you mean, but pink seems to work across the board in India. And you might be right that it’s a lucky colour. I’ll try to check.